There are several steps needed before you can activate channel management in Rentlio. When we connect a channel to Rentlio your calendar data gets sent to that channel. Because of that it is important to enter rates and availability correctly to Rentlio prior to connecting you. 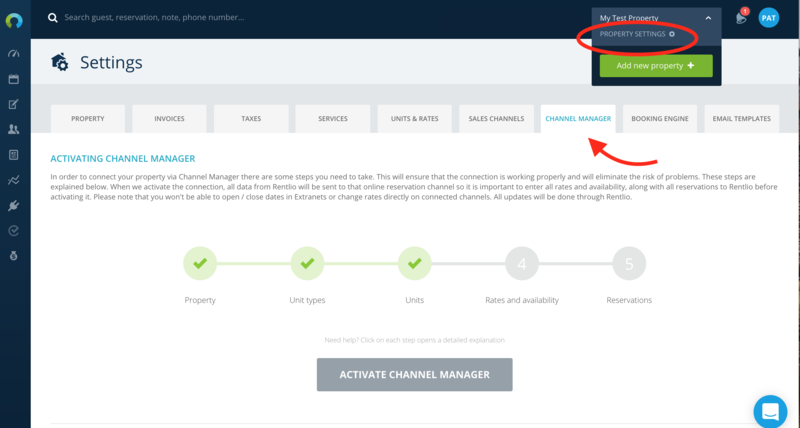 Channel Manager tab can be accessed through Property settings. There are 5 mandatory steps needed in order to activate channel management. Reservations - you should enter all existing reservations to Rentlio, except reservations made directly on Booking.com because we will copy them automatically for you. On Channel Manager tab you will see which steps are completed successfully (they are marked with a ✅). Uncompleted steps are greyed-out. If you are still unsure what each step represents simply click on it to see detailed instructions. Once you have activated Channel Manager you will submit connection requests so we can connect you. There are two types of connections: full / two-way connection (syncs rates and availability + reservations) and one-way iCal connection. Learn the differences and check which channel supports which type of connection. To submit a connection request simply find it on the list, click on ➕on top right and follow instructions. Important note: once you submit a connection request we have to connect the channel. We will contact you within one working day with instructions. In case of any questions, send us a message!